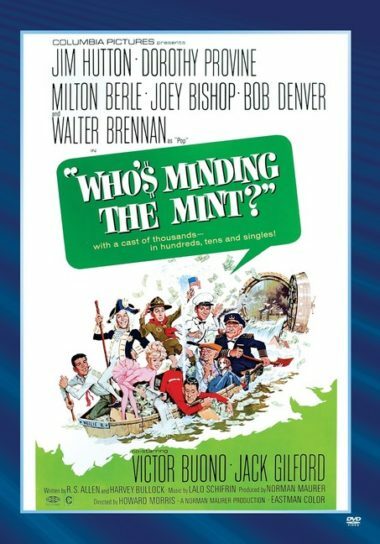 When United States Mint employee Harry Lucas (Jim Hutton, Major Dundee, Walk Don’t Run) inadvertently destroys $50,000, he enlists the aid of retired printer Pop Gillis (Walter Brennan, To Have and Have Not, Rio Bravo) and expert safecracker Avery Dugan (Jack Gilford, Catch-22) to steal the engraving plates. Deafened by his work in prison, Dugan gets a hearing aid from pawnbroker Luther Burton (Milton Berle) who, learning of the plot, cuts himself in. As the scheme’s “manager,” Luther then brings in Ralph (Joey Bishop, Ocean’s 11), who works in the sewer and can help them reach the Mint; the Captain, an operator of kiddie playground “boats” that can navigate the sewers; and Willie (Bob Denver, TV’s “Gilligan’s Island”), an ice cream vendor to be used as a decoy for attractive busybody Verna (Dorothy Provine, It’s a Mad, Mad, Mad, Mad World). Newly remastered. Jamie Farr; Walter Brennan; Jim Hutton; Dorothy Provine – 1967 – COLOR – 103 Minutes.